Foreigners who enter and exit Vietnam must have passports or valid documents and a Vietnam visa issued by the competent state offices of Vietnam, except foreigners exempted from visa (Article 4 of the Ordinance on entry, exit and residence of foreigners in Vietnam). Valid documents used to replace passport must be introduced before and accepted by competent authorities of Vietnam through diplomatic channel. Visa Vietnam consists of Visa stamp and Separate visa. Visa stamp is kind of visa glued directly into the passport. And Separate visa is issued separately along with passports or valid documents replacing passport. The durarion of visa Vietnam hs valid term not exceed 12 months and not to be renewed. Visa has valid to entry or exit once (one-time visa). Visa has valid to entry or exit multi times (multi visa). Visa A1: for members of the official delegation invited by the Party Central Committee, National Assembly, President, Government and guests of the equivalent level of ministers, vice ministers, presidents, vice presidents of the People provinces and cities under central and their relatives. Visa A2: for members of foreign missions, their relatives and maids. Visa A3: people who work with foreign representative offices or visit members of foreign missions. Visa B1: people who work with the Supreme People's Procuratorate, the Supreme People's Court, ministries, ministerial-level agencies, government agencies, People's Committees of provinces and centrally cities and the people's organizations. Visa B2: for those who implement investment projects authorized license by Vietnam state agencies. Visa B3: for people to work with Vietnam enterprises. Visa B4: for labors working at offices, branches of foreign economic and cultural organizations, and other professional organizations; non-governmental organizations based in Vietnam. Visa C1: for people traveling in Vietnam. Visa C2: for people entering Vietnam for other purposes. Visa D: for people who do not have invitation of offices, organizations and individuals in Vietnam, want to stay in Vietnam not exceed 15 days and meet the conditions to get a visa D. Visa D has valid for one (01) time and is granted a valid visa up to 15 days. Passport or valid other documents to replace passport. Passport has valid for at least one month compared to validity of granted visa. Foreigners should note that many airlines require passports must be valid for at least 6 months to get on the plane. The following documents (if any): the diplomatic note of the Ministry of Foreign Affairs of the host country or diplomatic missions, foreign consular offices in the host country or part-time (for guests of Ministry of Foreign Affairs); approval document from the Immigration Department (Ministry of Public Security), Bureau of Consular Affairs (Ministry of Foreign Affairs) or the Department of Foreign Affairs in Ho Chi Minh City. 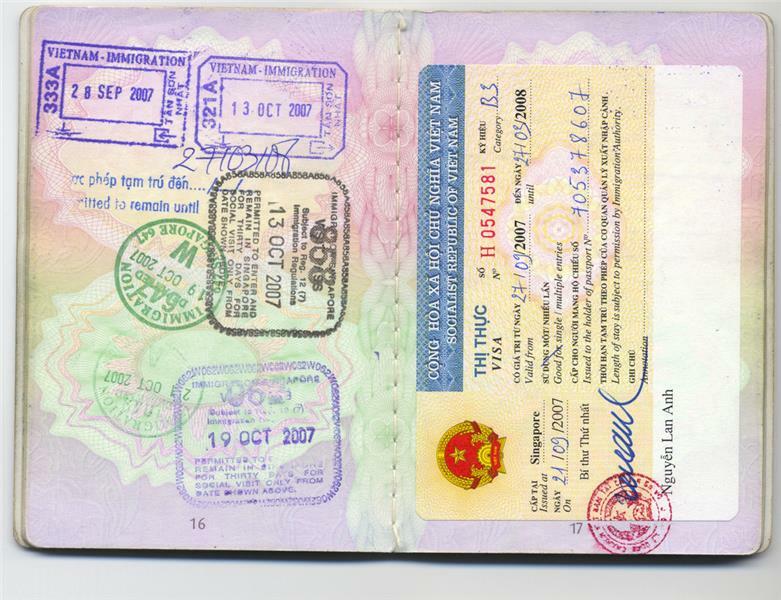 For people who have been accepted by the Department of Immigration, Bureau of Consular Affairs or the Department of Foreign Affairs in Ho Chi Minh City on the entry: Representative agency of Vietnam issues Vietnam visa on arrival according to the content announced within 2 working days from the date receiving a valid application. For visa D: Within 3 working days from the date receiving a valid application (application, passport and other papers). For Vietnamese people who enter Vietnam to visit relatives, if they have evidence of last entry into Vietnam not exceed 36 months from the time of applying visa for Vietnam: within 2 working days from the date receiving a valid application (including application, passport). Note: In case, Vietnamese people enter Vietnam to visit relatives for the first time, they should contact with their relatives in Vietnam to do entry procedures in the Immigration Department. After getting approval notice from the Immigration Department, Vietnam representative agency issues Vietnam visa within 2 working days from the date receiving application and customer's passport.